Rules were made to be broken, but these 10 are the key to your B2B sales and marketing success. Have you hopped on board the Content Marketing bandwagon yet? Whether you’ve beenchurning out fabulous resources for a while or are just now dipping your toes in the pond, there are some basic rules to observe (and occasionally ignore) to truly connect with your prospects and customers. While good grammar and correct spelling are always mandatory, never let your writing get in the way of your messaging. It’s the old, “keep it simple, stupid” maxim. If the content you’re generating isn’t connecting with its readers, your florid prose has most likely defeated its purpose. Stay on topic and create value for your potential customers by generating resources that resonate with them and legitimately address the business issues that concern them. Educate, inform and, when appropriate, entertain. As long as you’re successful in one or more of those aspects, mission accomplished. Thou shalt keep it short and sweet. Sentences, paragraphs, redundant language, etc. The more your copy is broken down into short, digestible chunks, the easier it is on the eye. White space rules in web copy. When the material warrants it, such as in the case of white papers, primary research and case studies, it’s okay to write a document that’s a few thousand words long. But when you parse it out in small, readable segments, it won’t look so daunting at first glance. Thou shalt use headers <- like this one, above a paragraph or at its opening, also help break up copy and make the information you’re providing in your copy a little more easily referenced and actionable. Thou shalt incorporate bullet points & numbers. Whenever possible –especially in lists like this one—break down your information into bulleted or numbered lists. Remember back to all those science papers you had to write in high school and keep your formatting consistent, or you’ll lose a grade for poor presentation. Thou shalt be direct. Don’t beat about the bush. Make your point and explain it to your audience in a straight forward manner. Remember, writing on the web is a second’s click away from oblivion if it’s not connecting with the reader. Thou shalt remember to speak the audience’s language. Consider the audience for whom you’re writing and tailor your approach accordingly. The “voice” you use for talking about women’s clothing accessories should not be the same one you adopt for marketing engine parts. Content writing for myriad and diverse clients allows you to put on an actor’s cap to some extent, inhabiting lots of varied roles. Thou shalt not use industry jargon. If you are a specialist in one particular realm –sales, for instance—don’t get caught in the jargon trap, writing in that secret tongue that only other club members can decipher. The rule we try to observe is, write for the professional, but write in a way that his or her spouse could actually understand it, too. Thou shalt define acronyms. There’s nothing worse than writing something that sends the reader scrambling to an online dictionary or Google search to make sense of all those industry-specific acronyms and abbreviations that are laced throughout the document. That’s FUBAR. Here’s the rule to be observed: The first time you reference a specific entity, spell it out and put the acronym in adjacent parentheses—Department of Treasury (DOT). From that point forward in the doc, you can use DOT at will; you’ve already educated your reader. No matter how familiar the acronym may be, CSN&Y fans, that’s the rule. But in this one instance, look up FUBAR if you need to. Thou shalt write in an Active Voice. Honor thy old, valuable resources by referencing & linking. Your content, theoretically, is providing valuable information to your readers and customers. Sweeten the value of your resources by sharing your sources of research with them as well. Attribute references to them in your copy and link them in your Word document or in the content management system of your website. Thou shalt remember to proofread. The most brilliant writers, including the one who won the Maryland 5th Grade spelling championship in 1968 (thanks for sticking the trophy in the garage sale, Mom! ), can make the occasional typo or mistake. However, you don’t want to come across looking like a dummy…or worse, careless. That’s not good for business. Proofread and copyedit your work. Rules are a good thing. You may even want to follow one or two of ‘em. But ultimately, the key to successful content is its relevance to its audience. 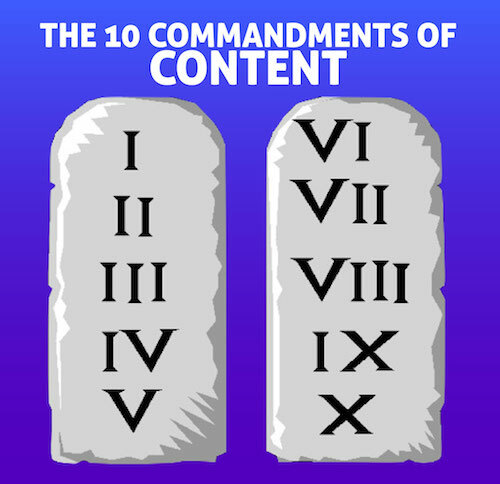 If you stick to these 5 basics: educate, inform, entertain, solve problems and provide solutions, and observe the 10 Commandments of Content, you’ll see your content boost your Sales & Marketing efforts in measurable, perhaps even remarkable, ways.